Applicable model for the “RAW FILE CONVERTER EX 3.0 powered by SILKYPIX” is added. Compatibility with “macOS Mojave” is added. If you use a PC with “macOS Mojave”, install the latest version(8.0.1.0) of the “RAW FILE CONVERTER EX 3.0 powered by SILKYPIX”. 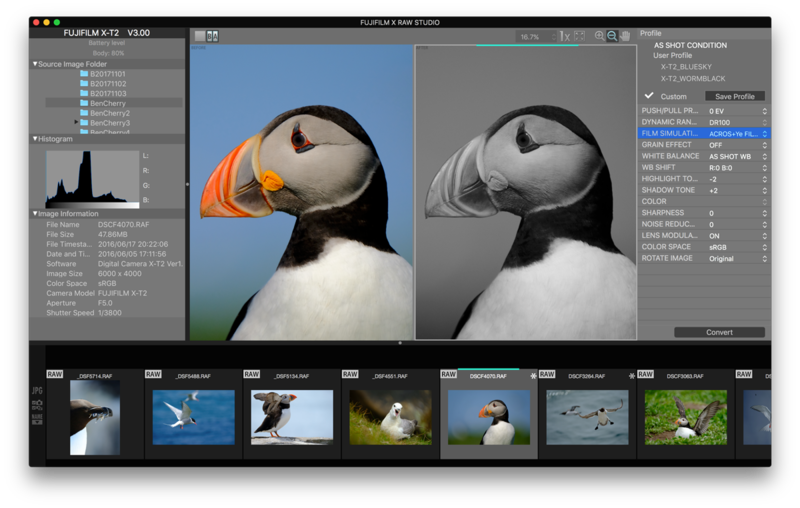 Applicable model for the “FUJIFILM X RAW STUDIO” is added. Easier method to check converted condition is added. 1) If you hover a pointer on an item in the list like FILM SIMULATION and so on, the preview image switches immediately. 1) Connection between a RAW FILE image and a converted image (JPG/TIFF) in the same folder is displayed on the thumbnail image list as a link. 2) By drag & drop of an image in the thumbnail image list, you can copy it to Explorer and activate software like Photoshop and so on. 1) Thumbnail image can be displayed and you can handle it during image loading. The compatibility of tethered shooting with “FUJIFILM GFX 50R” is added. If you use a PC with “macOS Mojave”, install the latest version(1.3.0) of the FUJIFILM X Acquire. If you use a PC with “macOS Mojave”, install the latest version(1.13.0) of the ”Tethered Capture Plug-in for Adobe® Photoshop® Lightroom®”. This entry was posted in Fujifilm GFX, Fujifilm GFX 50R, Software and tagged Fuji GFX, Fuji GFX 50R, Fuji GFX50R, Fuji Rumors, Fujifilm, Fujifilm GFX 50R, Fujifilm GFX50R, Fujifilm Rumors, FujifilmRumors, Fujirumors, GFX, GFX 50R, GFX50R, Medium Format, Super Full Frame. Bookmark the permalink. Trackbacks are closed, but you can post a comment.